Valiant designs networks for business of all sizes; from networks that support as little as 10 staff members to more complex networks capable of supporting hundreds of users, computers, mobile devices, and more. 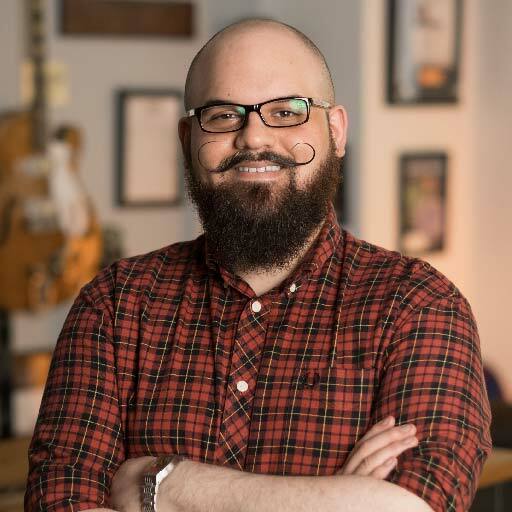 We choose to work with brands that fit in to our design philosophy of stability, security, and scalability, and this is why we commonly implement, and support solutions based on equipment from Meraki. Meraki’s selection network switches fill almost any need, ranging from 8 to 48 ports, providing options that make it simple to deploy networks of any size. 10Gb Ethernet copper connections provide plenty of bandwidth for data-intensive applications and VoIP telephony, and high-end options like redundant power supplies keep a network functioning through minor failures without losing a packet. With powerful radios and regular firmware updates, Meraki’s wireless access points provide great results, even in the most challenging of environments. Much like their network switches, Meraki has a wide range of access points available, from small models for light wireless traffic to specialized units designed for outdoor use. 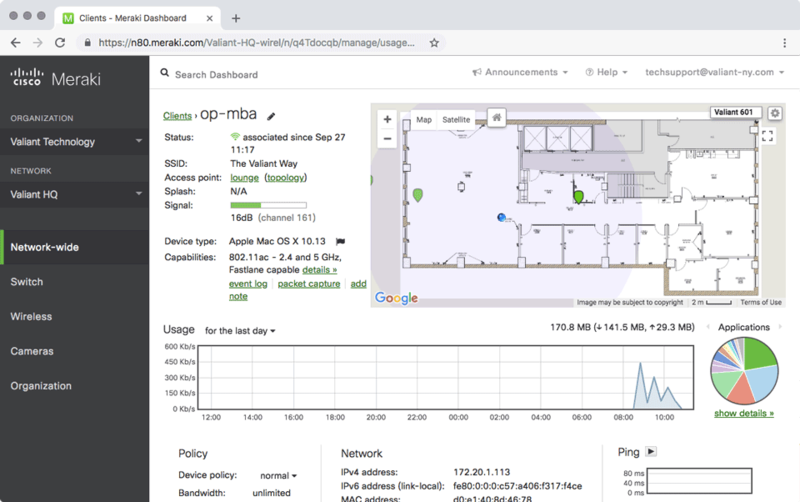 Meraki access points come with many of the features that network administrators have come to expect; 2-factor authentication, guest isolation, and walled gardens to restrict network resource access are all included. 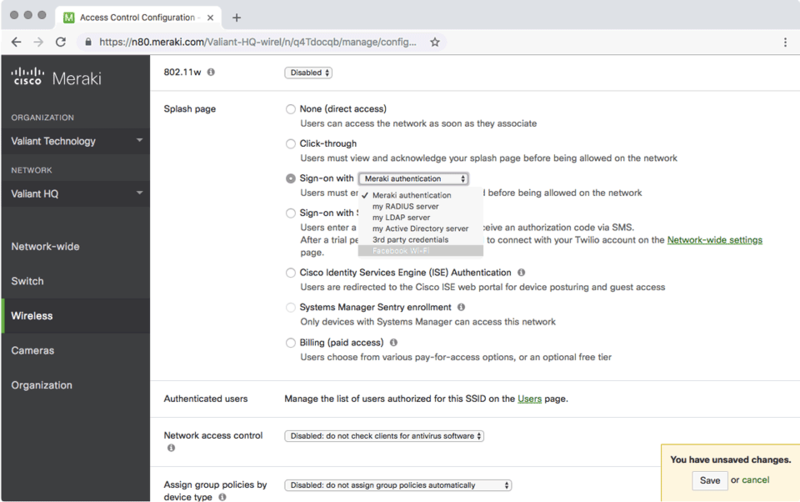 Guest access options include a splash page that requires visitors to agree to terms, log in, or provide other information before being able to connect to your guest network. 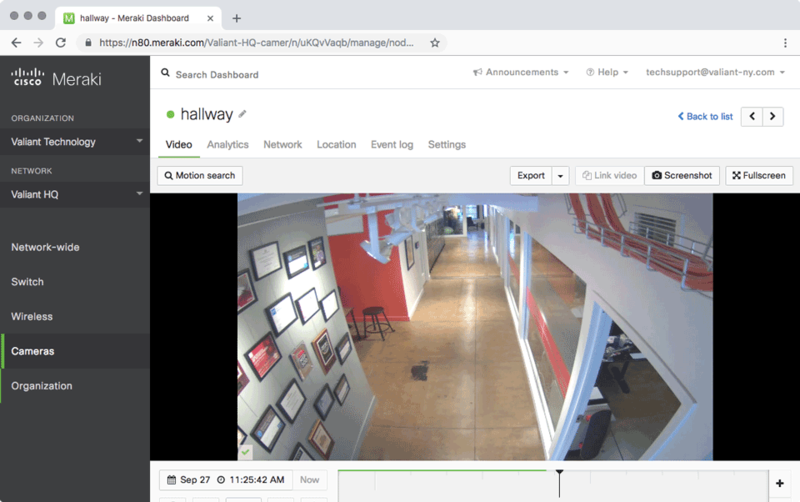 Meraki has even enabled social sign-on experiences for logging in to access points that can be used to generate social media activity and help promote your business to a wider audience. This may not be a feature most businesses look for while evaluating wireless solutions, but it can be a powerful way for, coffee shops, cafes, and other businesses that use Internet access to attract customers. The Facebook login promotes check-ins, displays your brand in the news feed, and can help gain insight into customer activity. Centralized management of network components simplifies deployment, troubleshooting, and helps to provide accurate insight in to usage, potential problems, and future needs. 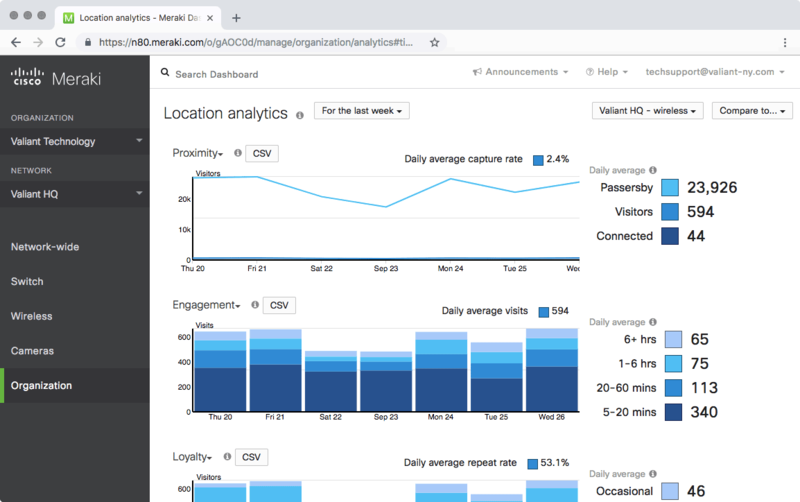 Meraki’s Cloud-based dashboard provides a single location to review activity, make configuration changes, and troubleshoot any issues that may arise. The Cloud-based dashboard allows Valiant’s techs to remotely diagnose and resolve issues that our clients experience, allowing us to solve problems quicker and ensure that the workday can continue with minimal interruptions. Equipment failures happen and being prepared to react quickly, and remedy issues is critical to maintaining business operations. Meraki understands this, and their customer support team is available to help in situations where parts need to be replaced. Experience a failure and need a replacement part? 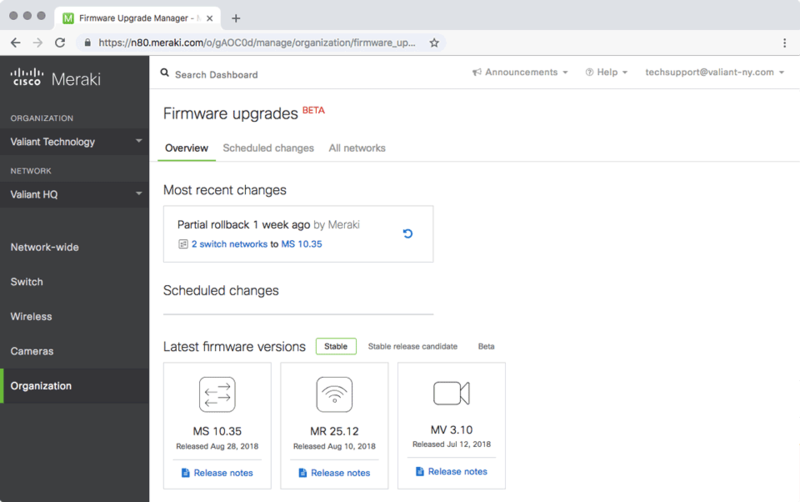 If your hardware is under warranty (an absolute must,) Meraki will send a replacement quickly to ensure that disruptions are kept to a minimum. Maintaining standards in our approach to network design allows us to quickly implement and support client solutions with a high degree of agility, benefiting everyone involved. 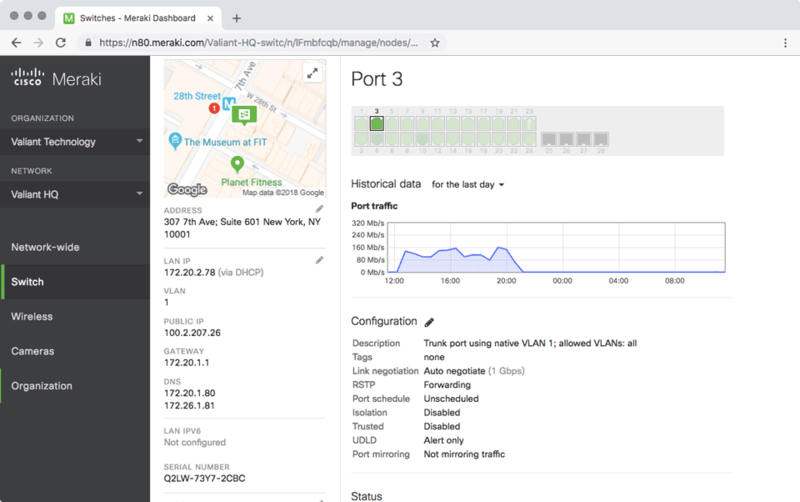 Our team of technicians are able to quickly diagnose and resolve issues, and our clients benefit from the stability, security, and scalability provided through the combination of Meraki’s equipment and our methods. Are network bottlenecks, stability issues, or security concerns limiting your business’s ability to perform optimally? Valiant’s team of engineers and technicians can perform a network review to understand any problems that may exist and implement a solution to keep you running smoothly for years to come. Get in touch today!